Serving the greater Atlanta area, including Alpharetta, Roswell, Tucker, Decatur, Duluth, Dunwoody, Tyrone, Sandy Springs, Kennesaw, Johns Creek, Lilburn, Smyrna, Fayetteville, Chamblee, Marietta, Norcross, Austell, Stockbridge, Conyers, McDonough, Fiarburn, Morrow, Stone Mountain, Mableton, Douglasville, Palmetto, Hampton, Monroe, Doraville, Powder Springs, Riverdale, Forest Park, Union City, East Point, College Park and the entire surrounding region. Celebrity Greens Atlanta is the Authorized Partner, Designer and Installer of Synthetic Grass, Artificial Turf and Artificial Putting Greens for the greater Atlanta region. We at Celebrity Greens Atlanta only install Artificial Turf and Grass products that are top quality, performance driven and always environmentally friendly. Choose Celebrity Greens Atlanta for your Artificial Putting Greens, Turf Playgrounds, Sports Centers and Synthetic Grass Playing Fields, Pet Turf and all your Synthetic Grass needs. Artificial Turf dramatically reduces the need for maintenance in your Atlanta lawn and eliminates the need for water. It also eliminates the need for harmful chemicals that ultimately seep into and contaminate the soil (fertilizers, pesticides, weed kill, etc.). No job is too big or small for our Artificial Grass and Turf Landscapers! 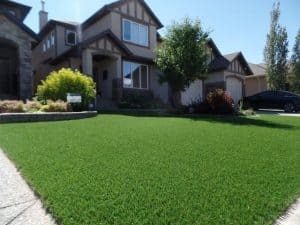 Our Grass is the most realistic and durable turf you’ll find anywhere. We specialize in beautiful, environmentally-friendly, professional grade golf greens, designed to maximize the use and beauty of your lawn or commercial space. 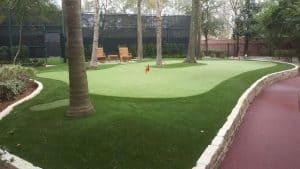 Our Synthetic Grass Designers and Installers can help you with any landscaping needs, sports fields, as well as certified playground surfaces, and we specialize in designing and installing the most advanced sand filled, artificial grass golf greens available today. Our Artificial Golf Greens can be installed indoors and outdoors anywhere in the Atlanta area. We offer a portfolio of design features including sand traps, water hazards, custom lighting and many other amenities to excite the game of golf. Contact us today and let us work with you to design your dream golf green or replace your existing lawn with an Artificial Grass Lawn. If you are interested in a Playground, Play Area, Dog Run or Sports surface, we can do that too! Contact us today at (888) 973-3397 for a free consultation!